The last street seller beckons around 11PM. He or she comes at almost the exact same time every night. The morning sellers have a very set schedule as well. I know who will come at what time. They’re so accurate they’ve become my alarm clock. Street sellers in Yangon have very distinct voices and jingles they use to advertise whatever items they have. Some shout. One man does this weird, creepy whisper. Others belt out melodious tunes—few of which are extremely irritating. Sometimes there’s music, or a prerecorded chant playing over a loudspeaker. 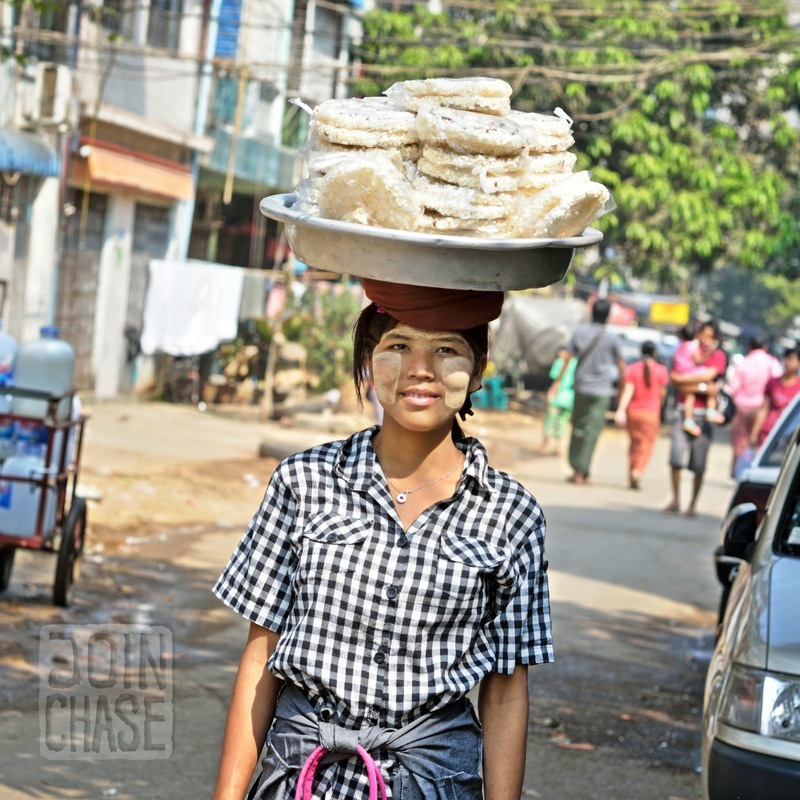 Some sellers have food they carry with trays on top of their heads. Others hold delicate chains of flowers for an offering to Buddha. Two men come around to collect garbage. A group of teenagers push jugs of drinking water. Music usually means the lottery ticket cart has arrived, or some other snack is for sale. I actually really love this aspect of Myanmar’s culture. That’s how early they start. Sometimes you can hear the gongs of monks passing through even earlier. Around 5:30AM. A new apartment is being constructed next door. Everyone knows it’s not fun to live near a construction site. As if competing against the street sellers, building noises can also be heard early in the morning. They usually stop about the time my alarm goes off. Go figure. But, all the outside commotion hasn’t gotten to me as much as an internal pounding from an apartment or two above. The pounding seems to be getting earlier and louder. This morning, on a Saturday morning, I was awoken by the sound of these pounds around 6:30AM. It’s past 9 o’clock as I type this line. The pounding is still going strong. It’s a constant beating, almost rhythmic in its pattern. Pound. Pound. Pound. Pound. Pause. Pound. Pound. Pound. Pound. Pause. I can’t figure out what this person or people are pounding so hard and early. It sounds as though they’re chopping something to cook. Perhaps they run a spice business and are literally pounding spices into powder from nut, plant or seed form. Another possibility is they may be making traditional medicine. Whatever the reason, one thing’s for sure. It’s annoying. If this were my home country, I’d probably complain about it. I’d find the culprit and ask them, politely, to stop pounding so early in the morning. Or, I’d complain to my landlady. However, this is Myanmar. And as a guest in this country, I need to adjust my lifestyle to match how most locals live. People generally go to bed much earlier than what I’m used to, and get up a lot earlier than I usually do. It’s been a few months already. I’ve tried to change, but making an adjustment like this isn’t easy for me. I love to stay up late, and enjoy sleeping in. Unless I’m fine with not getting a full night of sleep, which is also something I’m used to. However, I realize the importance of sleeping more than four hours per night, and I’m trying to get better about that as well. Perhaps the internal pounding is a blessing in disguise. One of life’s wakeup calls. It’s going to pound out bad habits I’ve had since college. It takes a good pounding to change, doesn’t it? Old habits are hard to break. Always ending with a lesson... that's why I love you. I'm also living here in Yangon, teaching English. Been checking out a few of your blogs this afternoon. I've thoroughly enjoyed them. I love your use of the present tense in your descriptions. Living next to a construction site is tough, but it could be worse. You could be next to a monastery. Joko, I'm assuming you must be living next to a monastery. HAH! I actually really love these noisy details of Myanmar. The shouting in the morning, the bells, the pounding... All of it adds to the experience of living here! Where are you teaching, and for how long have you been? How much longer will you stay? Thanks so much for taking time to check out my blog. I hope you're having a great time in Yangon.